I love to read cookbooks! AND, I love to read books (fiction and nonfiction) that have recipes in them. A dear friend recently gave me a copy of Delicious! by Ruth Reichl. The novel features a gingerbread that the heroine makes for her prospective boss—she gets hired on the spot just like I did all those years ago. 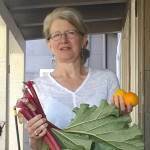 Though she has traumatic memories connected with baking, happily she finally gets to a place where she can bake again with pleasure. I imagined the taste and aroma of that gingerbread throughout my reading of the book. How lovely to come to the end and be presented with the recipe! This gingerbread, Billie’s Gingerbread, is light in color and packed with spicy fresh ginger, warm spices, and bright orange zest. Whisking the dry ingredients together. Cream the butter and sugar together until light and fluffy. Add the orange zest and grated ginger. 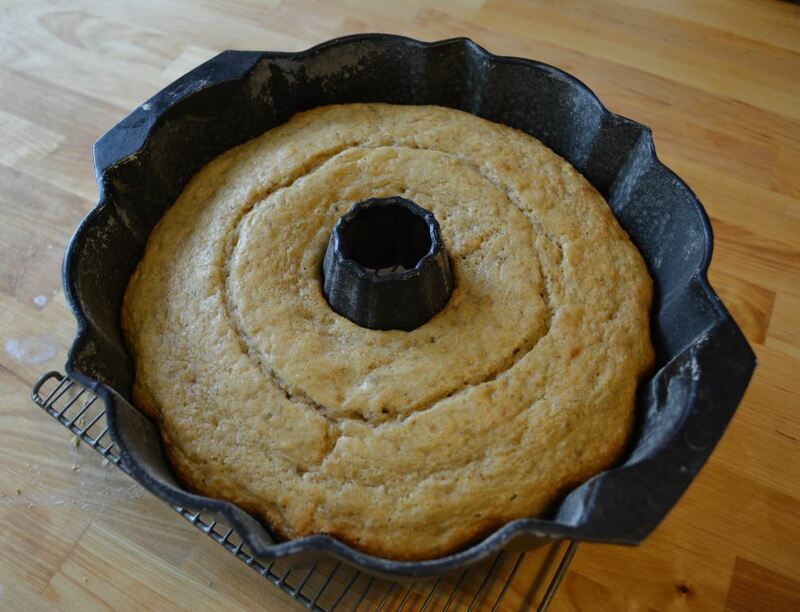 The recipe calls for a Bundt pan which produces a beautiful cake. A tube pan of similar capacity would work, and I also have baked it in various smaller pans. Tiny Bundt pans make for an adorable presentation, as do small panettone paper baking molds. Reduce the baking time to 30 minutes for the smaller cakes. This gingerbread is a delightful way to start the morning, along side a cup of afternoon tea, or with ice cream for dessert. The original recipe calls for grinding all of your own spices. I use an old coffee grinder. If you choose to grind your spices, grind them before you measure them. If that sounds like too much work, already ground spices are fine–just make sure you can remember when you bought them. Don’t use spices that are over a couple of years old. 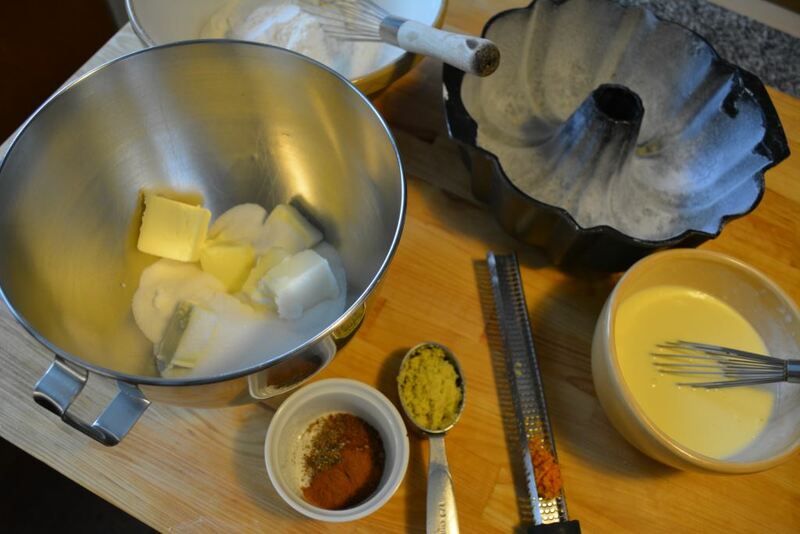 Preheat oven to 350 degree F. Butter and flour a 6-cup Bundt cake. 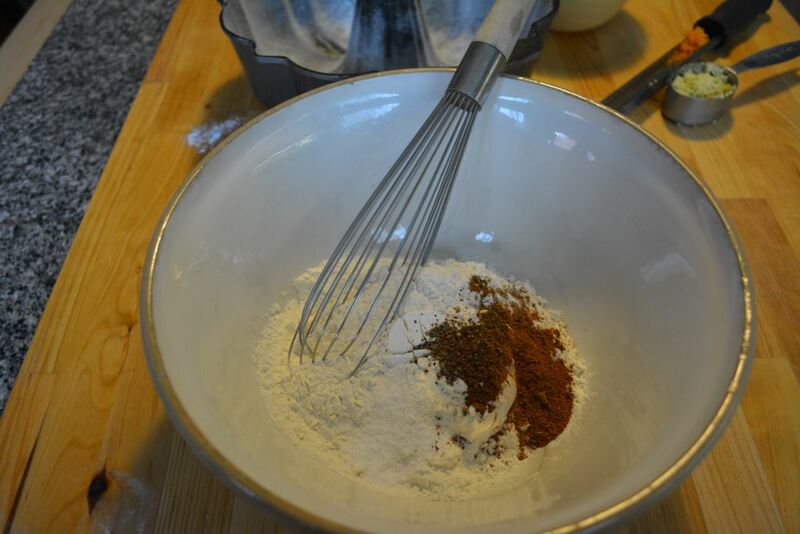 Whisk the flour with the baking powder, baking soda, spices and salt in a small bowl. In another small bowl, whisk the eggs and egg yolk into the sour cream. Set aside. 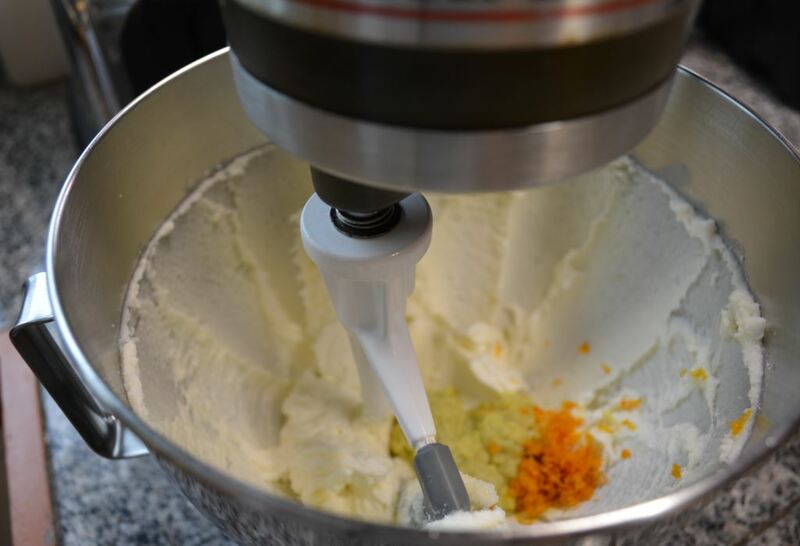 Cream the butter and sugar in a stand mixer until the mixture is light, fluffy, and almost white. This should take about 3 minutes. Grate the ginger root (I like to use a micro planer, and grate when frozen) and the orange zest (also grated with a micro planer). Add them to the butter/sugar mixture. Beat the flour mixture and the egg mixture, alternating between the two (starting and ending with the flour mixture) into the butter until each addition is incorporated. The batter should be light and fluffy. Spoon batter into the prepared pan and bake for about 40 minutes, until cake is golden and wooden skewer comes out clean. Remove to a rack and cool in the pan for 10 minutes. While the cake cools in its pan, simmer the bourbon (or orange juice) and the sugar in a small pot for about 4 minutes. It should reduce to about 1/3 cup. While the cake is still in the pan, brush half the soaking mixture onto its exposed surface (the bottom of the cake) with a pastry brush. Let the syrup soak in for a few minutes, then turn the cake out onto a rack. 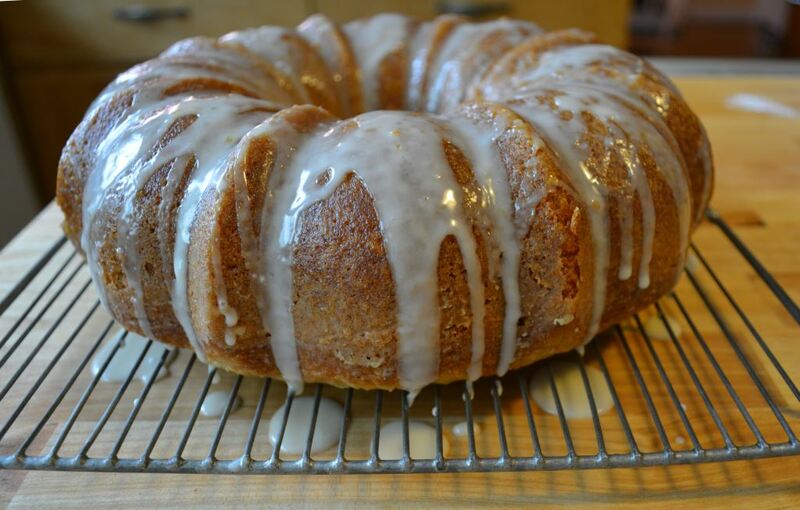 Once the cake is cooled, mix the sugar with the orange juice and drizzle the glaze over the cake. This is the best gingerbread recipe I have ever made. My husband loved it and he is picky. This will be the recipe I use every time I make gingerbread from now on. Thank you Sasha! Thanks, Tina! I am thrilled that your husband liked the gingerbread! I hope we can bake together sometime.